Alison Chambers has been to Geneva to report on the European Business Aviation Conference & Exhibition (EBACE). Here is her report. Extraordinarily, EBACE 2018 opened in Geneva with a hush. EBAA chairman Juergen Wiese called on assembled delegates at the ribbon-cutting ceremony to honour 93-year old Serge Dassault, a founding father of business aviation, who passed away on 28th May. This year’s exhibition, declared Wiese, would be dedicated to him, celebrating his outstanding achievements in the sector. Show buzz, however started early, on Sunday evening. An unstated invitation from Bombardier drew a packed audience at the nearby JET Aviation FBO. The stylish lighting, champagne and cocktails on arrival and black curtain gave just a hint of the unfolding drama. 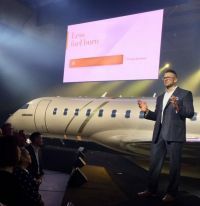 Shortly, Bombardier Business Aircraft president David Coleal was up on stage, announcing two new re-engined Global models, the 5500 and 6500 (the 6500 had flown across the pond to Geneva). Their heralding positions Bombardier as a new player in the super long-range business jet sector. In the past 10 years of EBACE, this was probably an OEM’s best kept secret, with engine provider Rolls-Royce quietly certificating its new ‘Pearl’ engines in February. Bombardier promptly renamed the new Global 7000, making its show debut, the Global 7500 (in a nod to its 7,700nm range). Next door at the TAG Aviation FBO, HondaJet CEO and founder Michimasa Fujino took the wraps off the HondaJet Elite, a striking ice-blue aircraft featuring an expanded 1,437 nm range, enhanced interior with built-in coffee bar, belted lavatory and speakerless sound system. It’s taken a while, but it’s an exciting time for HondaJet, which is lookinng forward to a commercial service start with France’s WiJet within months. Chairman Patrick Hersent was at the show as his company prepares to take the first of 16 jets, eight new and eight used. Selected to replace its Cessna Mustangs, a few of them will stay on to serve shorter-runway airports, like St Tropez and Blackbushe UK, that are out of the HondaJet’s reach, he confirmed. 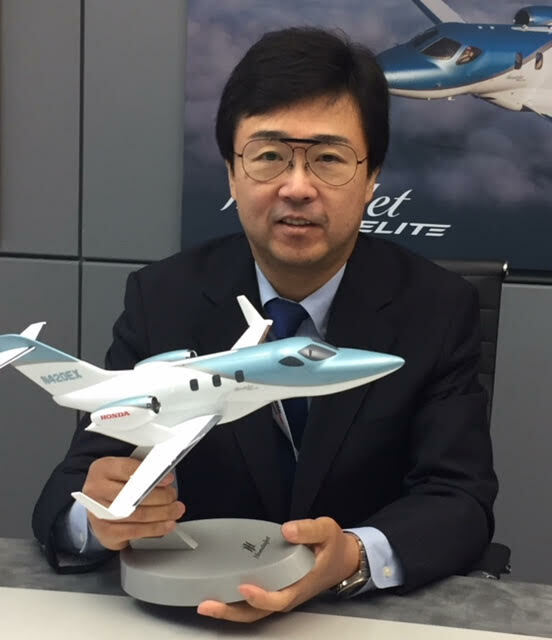 Fujino confirmed his keenness to secure a new UK sales distributor (TAG Aviation UK has ceased its relationship with the manufacturer, announcing a representative agreement with supersonic manufacturer Aerion at the show). Whichever company it is will have an extended remit, providing MRO support too. Piaggio, marking its 100th anniversary this year, said it was preparing to up production rates with its latest EVO model. At a press conference, CEO Renato Vaghi acknowledged exploratory talks with the Chinese about building Avantis there. Piaggio expects to break even in 2019 and be profitable in 2020 having recently undergone a major financial restructuring, he said. As the first Airbus ACJneos enter production, UK launch customer for the ACJ320neo Acropolis Aviation returned to EBACE to announce the selection of Rockwell Collins as the aircraft’s cabin-management provider, selecting Venue, Stage and the airshow moving map. And on the single-engine turboprop front, UK based Jet Exchange, making its debut in the exhibition hall, said it wants to be the first in the UK to put its newest Pilatus PC-12 on an AOC. Managing director Ian Austin, who has personally logged a record 7,000hr on the type, is currently writing manuals for the UK CAA to help it to understand the model. Pilatus Aircraft has still not re-opened the order book on its hot-selling PC-24. We will have to wait until NBAA rolls round in October or even into 2019. A coalition comprised of the European Business Aviation Association (EBAA), the General Aviation Manufacturers Association (GAMA), the International Business Aviation Council (IBAC), the National Air Transportation Association (NATA) and the National Business Aviation Association (NBAA) banded together at the Dassault-sponsored media lunch to reinforce their commitment to advancing the development and adoption of alternative sustainable jet fuels, as part of the industry's long-standing commitment to emissions reduction, including carbon neutrality from 2020. It unveiled FutureOfSustainableFuel.com and a newly-published guide for anyone looking to use alternative fuels. 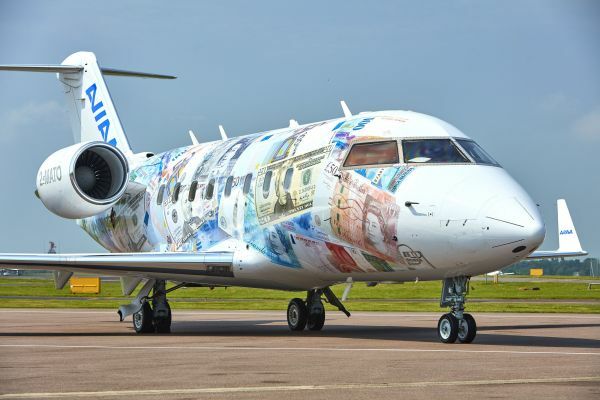 "It’s not just about fuel – but a reflection of this sector’s overall commitment to climate change,” said David Coleal, chair of GAMA’s Environment Committee and Bombardier’s Business Aircraft president. This year, several OEMs flew aircraft to EBACE using alternative fuels; notably, Bombardier Jets used Air BP biojet (sustainable alternative jet fuel) for their flights to Geneva. Complementing its engaging new comms strategy with the hashtag #ExpandingHorizons, EBAA shared results from its newly engaged Think Young survey. Some 2,000 millennials from Germany, France, UK and Switzerland said they were keen on new technology – especially VTOL models, with 59% believing personal air transport vehicles will drastically change society. Sixty percent would use ride-sharing sharing services, but only 46% automated ones. Some 40% believed climate change would have a big impact on the future of air transport. A session on expanding the role of women in corporate aviation was a well-attended forum in the innovation zone. Taunya Renson-Martin, EBAA’s communications adviser, said "a company that doesn’t have access to the greatest talent available, regardless of gender or culture, will not reach its full potential”. Luxaviation Helicopters CEO Charlotte Pederson said it should be easy to attract women to aviation, with social media an increasingly effective tool for reaching new audiences. "Quite simply, women in aviation will attract more women into aviation,” she said. Women in Corporate Aviation chair Karin Muller said some 100 jobs are embraced between an aircraft’s take-off and landing. "I would invite any women with interest in such jobs to apply,“ she added. Another hot topic was cyber-security. 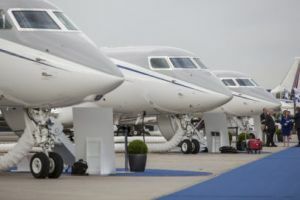 As the number of cyber-attacks on business jets increases, Satcom Direct (SD), the connectivity, hardware and software supplier, brought along a digital security professional (a white-hat hacker) to drive home the need to be vigilant. Delegates were shocked to learn how easy it is for malicious hackers to create fake websites, steal Identity information, crack passwords and shadow key strokes within minutes using freely-available web software. SD used interactive demonstrations to showcase its Cyber Security Solutions, urging IT departments to apply full corporate compliance protocols to their fleets, as they would in their offices. And more disruptive models are gaining traction. AVIAÂ is the latest. A tech-based global purchasing organization, co-founded by Dustin Dryden and James Hall and focused on Europe and the US, is on a mission to deliver some 20%-plus savings on big-ticket items like fuel, MRO, insurance, connectivity and more, for its member aircraft operators – by buying in volume. It brought a striking ‘follow the money’ Challenger 604 to Geneva, but just missed the window to showcase in the static display, so parked up at TAG’s FBO instead – to admiring glances. Special thanks to AVIAÂ who flew a number of media (and me) over in style from its UK London Oxford Airport base. Without a doubt, flying privately is the way to travel and the TAG Geneva team were brilliant too looking after us.